The "keyboard cowards" who racially abused Australian rules football player Liam Ryan "must be held to account", says his club's chief Trevor Nisbett. 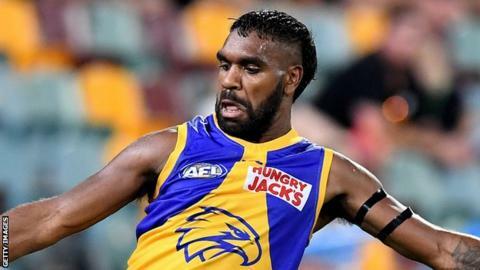 Ryan, who is one of several Aboriginal players for AFL champions West Coast Eagles, was called a "monkey" in some comments replying to an Instagram post from broadcaster Channel 7. A shocked and upset Nisbett called the comments "absolutely abhorrent". "This must stop and we must make a stand," he added. The controversy follows the online trolling of female AFL player Tayla Harris, with the response to a picture of her taken during a match being compared to "sexual abuse". The comments about Ryan were made in response to a Channel 7 post asking if the 22-year-old should be suspended for an incident with another player in his side's season-opening defeat by Brisbane Lions on Saturday. "To have this occurring so consistently, albeit by a minority of people, is distressing and completely unacceptable," said Nisbett. "No one should be subjected to this hateful and vitriolic garbage." In April 2017, Aboriginal players from the AFL wrote an open letter to the sport's fans calling for an end to racial abuse. However, last month, Adelaide Crows forward Eddie Betts was called a "monkey" on social media in replies to a club post showing him arriving to play in a pre-season competition. Following the racist abuse of Ryan, AFL Players' Association chief Paul Marsh said: "More hatred directed at one of our players. "This ongoing issue needs to be addressed at the source. "Change is needed so that these gutless people can't hide behind anonymity."